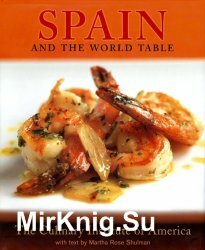 Spain and the World Tableimmerses home chefs in the exciting and complex world of Spanish and Spanish-influenced food, wine and cooking. The book explores the best of regional Spain, from Galicia to Valencia and Andalusia. From regional wines and mountain cheeses to olive oils, piquillo peppers, Serrano ham, and a host of other artisanal food products, the elements of quality and style in this world of Spanish food and wine traditions are brought to your home.